The Free Space Gallery actively promotes positive well-being and the work of contemporary artists based on principles of free thought and expression. In line with this, artists Daniel Regan and Philip Levine will be exhibiting work on the subject of hair loss through their varied artistic practices. The subject of hair (and the loss of it) is ever-present in our society, yet still remains somewhat of a taboo. Society surrounds us with images promoting the abundance of hair, as if it somehow signifies beauty and perfection. Yet the topic of hair loss often remains undercover, avoided and highly stigmatised. 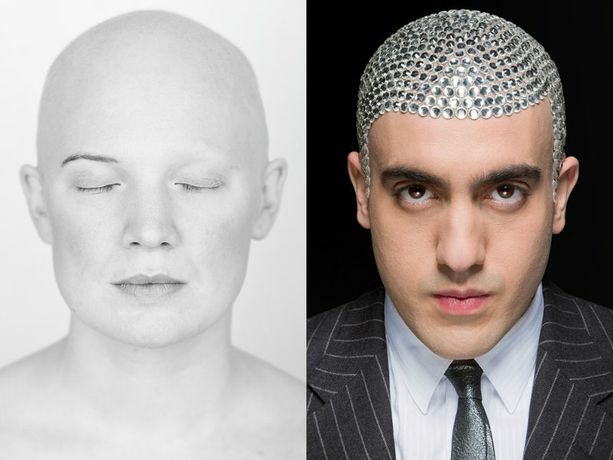 These images aim to uncover that which is unseen via Regan's Alopecia Project and also via Levine's work Headism (photographed by Regan in 2011). The exhibition  located on the first floor waiting area  casts light upon the importance that society places on hair and its ability to dramatically transform our identity. The Alopecia Project www.danielregan.com The true message of the project is that it's OK being you, but most importantly being the you that you choose. Alopecia affects the body but also the mind. The condition can cause partial or total hair loss for unknown reasons and affects people from all backgrounds, races & genders. Regrowth is unpredictable and in many cases non-recurring, affecting approximately 1.7% of the population. There is a huge amount of shame associated with alopecia, especially for women. When a woman loses not only their hair but also their eyebrows and eyelashes they immediately begin to feel like less of a woman. Throughout this project Daniel invited people to be photographed how they wanted to be photographed. For some it involved baring all and showing their ânaked selves' for the first time. Daniel is an artist whose work focuses on themes of psychology and mental health. Headism www.philsays.com / www.headism.co.uk London born artist Philip Levine started using his head as a canvas for creativity back in 2006 when he began to go bald. Using it as a form of artistic expression, Philip's art aims to give out a social message and has inspired many men, women and children who are affected by something negative in their life to embrace their problem and use it in a positive way through art and creativity. Philip's debut exhibition âHeadism', sponsored by Gillette, showcased head designs that have now become iconic around the world. This creative art form has won him a place in both Time Out's Culture 100 2013 and The Observer's Future 500.